My hands are raised. I'm guilty. ...okay, that's exactly what it is! But this is one of those novels that mustn't enter my did not finish column, and here's why. A few months ago, I did a short creative writing course and our final assignment was to write a short story. 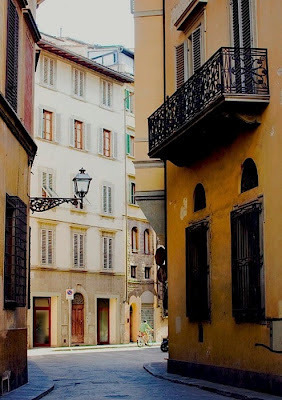 My story was set in a Tuscan town, and revolved around one character observing a particular stranger from the balcony of their apartment. After I submitted it, my tutor gave me some valuable constructive criticism, also asking me who my influences were. He name-checked A Room With A View, stating that my stranger on the street was reminiscent of a character in Forster's novel. Even though it had been patiently sitting on my bookshelf, I hadn't read the book, and now it was willing me to open its pages more than ever. I had intended to polish my short story a little more and then post it on my blog to get some opinions, but after reading my tutor's comparison, I decided against it until I could read A Room With A View. I need to find these similarities myself, and see how much of my short story I can improve from that perspective. But A Room With A View is testing my patience. I've said enough times during my reviews that I really am not a patient reader, and for a book to keep my interest the plot has to be steady, but group intriguing incidents close enough together that I'm not going to get bored. This rule usually bends for the classics – Jane Austen takes her time, but her wit and observations reel me in – though it's often the case that I need to spend a longer time-frame reading them. So, I've had an idea. Every month, I'm going to pick one classic novel from my shelf and spend four weeks reading it alongside contemporary books. That way, I'm not going to get frustrated that I'm spending so much time waiting for a story to evolve when I could be reading something with more immediate gratification. And my reviews won't stall! I'm also thinking of starting a monthly classics reading group on this blog, much like the Sense and Sensibility read-along I did last summer. Let me know in the comments section if this is something you might be interested in. For now, though, I'll spend the next few weeks with A Room With A View. And, hey, maybe you'll finally get to read that short story of mine! Where has Quote of the Week gone, you ask?